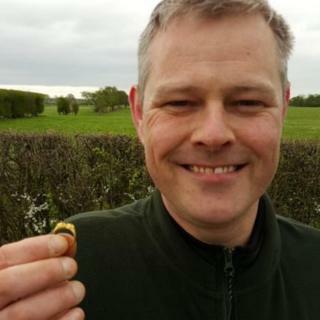 A 15th Century gold "love ring" found by an amateur metal detectorist in a field near Harrogate has sold for an undisclosed five-figure sum. "When I first found the ring, I couldn't believe my eyes," he said. "Until then I had only found the odd silver coin, but this looked like a proper piece of jewellery, which seemed to be made of gold." The double bezel chased ring is engraved in Medieval French "ne mem - bon" with a heart at the end. The technical writer from Castleford, who is part of a metal detecting club, said he picked up the signal as he was walking back to his car to fetch his coat. "One of my friends said it was far too yellow to be real gold and looked like costume jewellery. "He told me I should just throw it away but the ring was relatively heavy and I thought I better ask our dig organiser. "Luckily, he confirmed that this was definitely an antique ring, most likely Tudor Gold." It has been sold to an antique dealer in a private sale after local museums were unable to raise funds to buy the ring. Mr Rossiter said he turned to the hobby after his daughter rejected the equipment he bought for her via an auction website.